All subjects are not equivalent. There are easy subjects as well as difficult subjects. There are high scoring subjects and low scoring subjects. Marking also can vary: there can be strict marking or liberal marking in different subjects. As such, aggregate of different subjects is not a fair criterion to give an overall rank to a student. Therefore use of simple average (aggregate) Marks is not a good method to determine eligibility for university admission. For example, marks of one subject could have a range from 5 to 70 while the range for another subject spans from 45 to 99. A student who obtained 70 is the best among the lot in the first case and the one who obtained 70 in the second case is a mediocre student. When the simple aggregate is taken for admission, the best student in the first case is treated equally to a mediocre student who opted for a relatively easy subject as in the second case. This issue was the theme for a series of discussions in academic circles and in spite of several advanced methodologies available for standardisation, Z score approach was adopted about ten years back as the criterion for university admission due to its simplicity, computational convenience, application efficiency and the need for only two parametric estimates for its calculation. What is the Z-score and how it is calculated? The Z-score is calculated by subtracting the raw mark of the subject by the mean mark of the subject, and then dividing by the standard deviation of the marks of the subject. (see graphic). The Z-score for a given subject is comparable to the Z-score of another subject, although raw marks are cannot be compared. In the Z Score method the average of each subject is brought to 0 and the spread is usually from +3 through 0 to -3. Z Score gives the candidates the position in each subject with respect to the average mark scored by the candidates in that subject. Z Score therefore ranges from around +3 to -3 (e.g. +1.252, +2.012, -o.958 etc.). Then, the average Z Scores of the 3 or 4 subjects of the candidates are taken as the final Z Score, which will be used to rank the students in each stream, island-wide and district-wise. Citing an example, Prof. Thattil said the raw mark of 50 for Physics may be an above-average mark, while for Geography it may even be below the average. 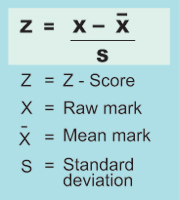 Although mean and variance of raw marks can differ from subject to subject, the Z-scores are distributed with a mean of zero and variance of 1, for any subject – effectively bringing all subjects to a common ground. Simply put, the marks of the subjects are thus standardised to make way for fair university admissions. District quota system According to the present university admission policy, the admission to each course of study (e.g. Medicine, Engineering, Agriculture, etc.) is governed by the following quota system, except in the case of Arts where the admission is made on all island merit basis. This district quota will be allocated to the 25 administrative districts on the ratio of population of the district concerned to the total population in the country in respect of each course of study. Similarly, the 5% quota for the underprivileged districts will also be allocated in proportion to the population of each such district. There are 13 districts which have been declared as educationally disadvantaged districts by the University Grants Commission. These districts are: Nuwara-eliya, Hambantota, Jaffna, Kilinochchi, Mannar, Mullaitivu, Vavuniya, Trincomalee, Ampara, Anuradhapura, Plonnaruwa, Badulla and Moneragala. Available places in each course of study in the University system will be filled according to this national policy. This will be done by ranking candidates using their final Z Scores. After processing the university admission applications, the UGC will determine and announce the cut off Z Scores for each course of study in respect of each district, as practiced earlier. How to check your University, Faculty based on Island Rank IR and District Rank DR? mama 2019 a/l karanne biology, chemistry and physics kyna subject 3n.mata dana gnna oni ape biology syylabus eka thama hariyata nathi nisa ape Z score eka baladdi apita 2018 & 2017 batch walata sapekshawa wisheshayak karanawada kyla.nathnm exam ekata padam 7kin enawada kyalath dana ganna oni. 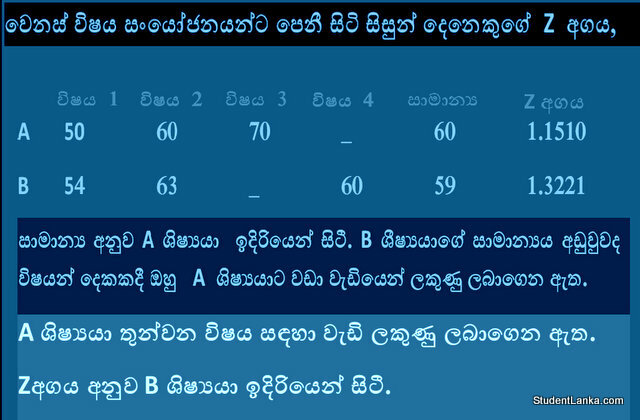 In earlier occasions Z-scores are calculated separately for each examination. Then campus selection will be done. But you need to ask this from Dept of Examinations. My subjects are ICT, french and media. Can I know what kind of Z-score Media has? my z score is 1.2495. so what are my selecting campuses? 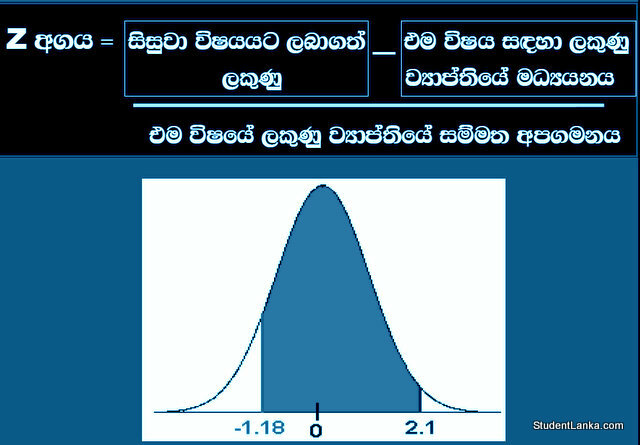 mama 2021 A/L karanna enne .maths,physics and ICT mama select kara gathta. mata enter wenna puluwan government universitywala faculties monawada? You cannot do Engineering. But you can do some physical science courses at IT degrees. My stream is biology.can I know some Example marks that I can have to get 2.2358 as my Z score.? 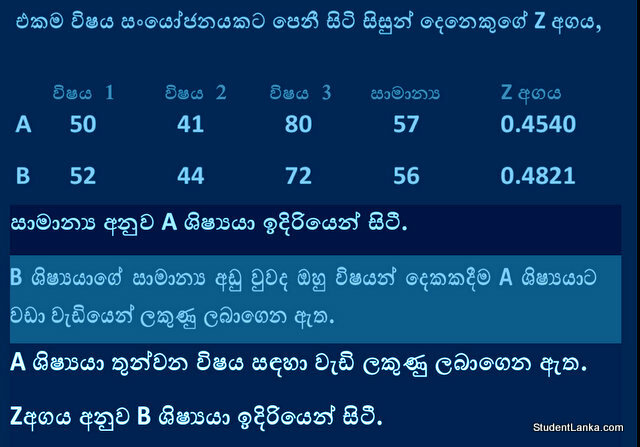 The Z score seems to standardise an otherwise biased method for university selection, in that “easier” subjects are brought on par with more “difficult” subjects in determining suitability for admission. This is on the premise that it is more difficult to score higher marks in more “difficult” subjects while it is easier to score higher marks in “easier” subjects. This also results in an unfair weight being given to subjects like mathematics and physics and hence limits the opportunities for achieving university education for those types of intelligence that are not in the engineering or bio-science streams. According to Gardener, there are many different types of intelligence which can be measured in different ways. Unfortunately for Sri Lankan students, these will almost never be allowed to emerge or achieve prominence, which is a continuing loss to the nation.